It was around 7pm on Friday when I found myself walking along Addison Street in Chicago’s Wrigleyville neighborhood when I stopped at the Clark Street junction. In front of me, basking in the city’s aura, was Wrigley Field. The bright red lights had seized me, and for a couple of minutes I was in complete awe. Being new in a city is something I’ve experienced before, but I feel it’s a completely different circumstance for cities like Chicago. There are so many landmarks, and so many spacious areas to explore, and maybe in due time I’ll pass by without even stopping to steal a glance, but that night I had to take it all in. I was starstruck, and boy was I about to be starstruck all night. Taking a left on Clark, I quickly hopped in line at the Metro, one of Chicago’s patented music venues, and as I stood there in a complete haze, I had no idea what was about to rush over me. 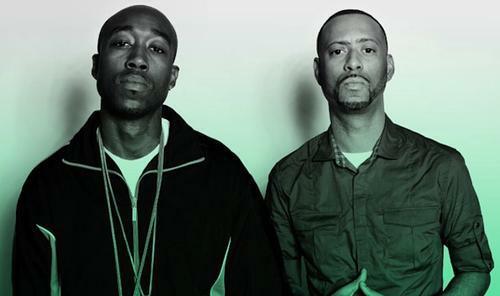 On the Metro’s large venue sign in the front it simply read: 3/7/14 Freddie Gibbs & Madlib. Around 8pm I filed into the Metro’s interior, a comfortable yet cavernous area where the floor ran right to the stage, letting fans get as close as heavenly possible. There was an upper balcony, like that of Lincoln Hall and the Fillmore in Detroit, and on both floors there were bars at the back, adding to the atmosphere. I met up with Back Beat Magazine’s Ella Campbell—who made the trip from Ann Arbor, Michigan—and her friend Jeremy. We found a nice spot to catch everything, and pretty soon the festivities began. The Impala Sound Champions opened the night right as attendees filed in, and with an all vinyl set, they laid the groundwork and set the tone for what was to come. Split between two incredibly in-depth and seasoned DJs, Impala Sound Champions paid tribute to not only Madlib, but also to past greats like James Brown and hip-hop legend J Dilla. At one point they started spinning the original samples to Dilla’s “Workinonit” and “Time: The Donut of the Heart” and a warm reception greeted them from the crowd. After an hour of comfortable spinning, they left the stage for the show’s second opener. Lucki Eck$ and his DJ filled the venue with music for about 30 minutes, and although he looked visibly nervous, Eck$ held a sense of calm around him. He very rarely looked at the crowd, gripping the mic stand for support and added artistic reference, but he also spit wondrous bars that have rightfully earned him a spot on various SXSW showcases this year. Now that I can fully look back at this performance, it’s apparent that Eck$ is playing his style to a point. He’s very nonchalant in his makeup, almost ushering us in as an audience to pay more attention than he gives effort, but all this is simply a characteristic that adds to his individuality. This is especially encouraging coming from a young teenager in Chicago, where trap and drill music is dominating the South and Westside communities and playing as anthems to gunfights. In neighborhoods that are purposely being underfunded by the city and its politicians, drill is the current wave, coming from a community that is both segregated and ignored. The music of drill hip-hop is tough, toting lyrics about violence and gangs, but unlike artists like Rick Ross and Drake who use lyrics like this in a celebratory nature, drill artists—such as Chief Keef—rarely sport a positive shine. Often times delving into nihilistic and exuberant bleakness, drill is really a culmination of a community that’s been exiled from its own city infrastructure, and the violence and despair that come from it. With Eck$ we’re witnessing something different. We’re seeing a young artist out of Chicago serving hip-hop in other ways, offering an alternative—whether he meant to or not—to the communities infused with drill music and the sociopolitical damages they’ve suffered from. His music is instinctive, with lines about making it and battling other rappers, so it’s just as appealing, and it’s also different, something Chicago’s hip-hop scene desperately needs. After Eck$, the venue become a standstill, where the noise levels started to falter, and the lights began to fade; it was time, oh boy was it time. As Madlib strolled onto the stage, the crowd erupted. Hands flew into the air, people started yelling “Madlib!,” and the anticipation was fully reached. Resting for a few seconds behind the deck, the Mad Liberator started spinning some of his old classic tunes. For nearly half-an-hour Madlib remained up there alone, just spinning tracks. At one point he started playing one of his own tracks, “The Official,” off of Jaylib’s Champion Sound, and my whole body froze. Tears started to well up—everything was in its place. Just as wonderful as it was to hear this track live, it was emotional in context. To hear Madlib pay tribute to his mentor and friend was something special. This wasn’t even the cap, because afterwards, Madlib switched gears and started playing Slum Village’s “Fall in Love,” perhaps the ultimate Dilla tribute I will ever hear grace a live stage. At this point the tears were free flowing, and everyone was just vibing. What got me so hard was that this night was just as much a tribute to the late Dilla as it was a Freddie Gibbs & Madlib show. The Impala Sound Champions spun several Jay Dee tracks, and to hear Madlib personally honor his friend was something else. It was just more proof that Dilla’s influence is ever flowing, borderless and boundless as it touches and influences thousands of artists. It was a sudden movement, and as Madlib quickly cut the sound, Gangsta Gibbs rolled out sporting an ever-so-classic “God is Gibbs” hoodie. Busting right into “Supplier,” the opening track off of their collaborative record Pinata (out March 18th via Madlib Invazion), the entire crowd went into a synchronized frenzy. The presentation that Freddie Gibbs and Madlib displayed was a testament to the ultimate hip-hop congregation. While the Mad Liberator continued to profile dusty production that sparkled with innovative sound, Gibbs went all out. During most songs, Madlib would cut the production early and let Gibbs flow a capella, and he didn’t miss a beat. The Gary, Indiana native was the basis for perfect stage presence as far as MCing goes. He strolled up and down the stage, exchanged glances with Madlib, let his relatives on stage, played to the crowd and even sat down for a bit, utilizing the stage as his own personal throne. With his renowned deep delivery, Gibbs blazed a trail, taking his own personal background from Gary and implementing a certain West Coast L.A. 80s sort of a feel to it. “Thuggin” was the shows standout. Madlib’s slinky harp sampling crept naturally into the set, and Gibbs went off. Like other pros in hip-hop today, Gibbs’ ability to retell a story is unbelievably inexorable. During a live show he only proves this further. The environment during Gibbs and Madlib’s whole set was united. We all stood in awe witnessing two hip-hop staples go off, and when things turned exciting, we all waved, bobbed and wept in unison. Here we as audience were treated to something that is rare during shows these days. Not only did Gibbs cut off Madlib, one of the most prolific producers ever, he did this in order to display his loyalty to us as his fans, to Chicago and to the region where he’s from. He rocked his roots, and implemented “place,” something so vitally important to hip-hop, and if someone at this show didn’t appreciate the music, they were sure to smile during this conjuncture. Friday showed me just how special hip-hop is to me. It reassured me of my love for the culture, the music, the history, the influences and the people who both represent it and celebrate it. The Metro was all out, flowing as one, and to me this is what hip-hop does; hip-hop brings together a community, celebrates collaboration and uses its voice to combat life’s ills and celebrate life’s wonders. Between the Impala Sound Champions, Lucki Eck$, Freddie Gibbs and Madlib, this show was an all-time classic for me, something I will never forget.